Just lately something has changed for me. My girls are growing up. This morning I thought, when they get up in the morning I feel like I get to spend the day with some of my best friends. I`m just really loving my time with them lately. It`s not that life is perfect for us, or that I never get annoyed at them…. …But the way they: imagine, make me laugh, EXPRESS affection, see the world, and create things on their own really brings me JOY right now. This morning I felt really grateful for this time in our lives. What is your overwhelmingly big or small blessing from today? I love this. LOVE it. It is the sweetest thing to feel like your daughters are also your friends! The picture is perfect with your post. 🙂 I could have taken a similar picture this morning – I overslept, and my girls got up earlier than usual, so it started a little hairy for me. But it’s a precious day, nonetheless. 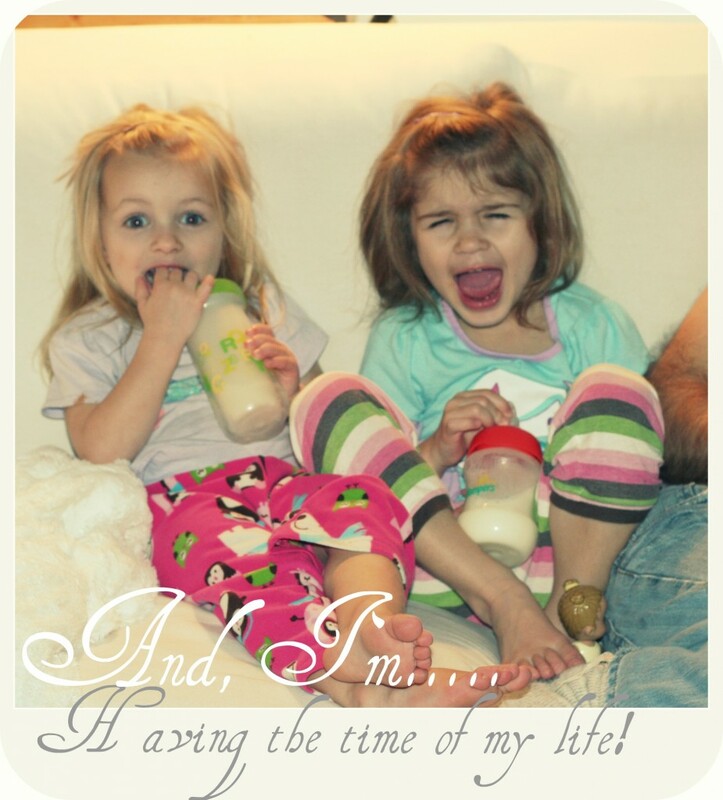 i think that moment in time of having two kids is still probably my most “happy sighs” time. which sounds bad, since i now have four…:) i LOVE having 4 girls. but with two, i could focus and watch ALL of them. with four, i treasure the moments of HAPPINESS here at home with izzy and Eden but feel as if i’m missing out on a huge portion of my other two at school. and when all are home…well, lets just say there are A LOT of various likes, dislikes and personality to cover. one of my happiest moments is watching the two youngest reading on the couch while Jacqui is making a “magazine” and Aleiyah is playing with the cat. all happy and in one spot. i love it. love the LIFE captured on your photo. Last weekend we took the whole family out to a chinese buffet. The older kids thought it was awesome that they could get their own food, the younger kids were happy because they could eat right away. There was no melt downs. It was just a fun evening out all together, calm, enjoying good food with our whole family. Rich and I are so excited to enter this calmer phase, where the kids are old enough to have good convo and we can actually do things together without it being a big stressful thing. I look forward to teenage years immensely. Maybe I am silly and should be afraid, but I’m not. I can’t wait. i think it`s partly because we both like good conversation! So happy for your happy life! Love the picture of you two beautiful daughters too! ….I love to see the differences between our boys and girl!! I’m so facinated to see how natural it is for Elyse to make things, create, color, draw, nurture her 18mo old brother, love the cat (she informed me the other day that she’s “the only one who likes the cat in our whole family!” and she really does!!) The Boys are so rough and tough, love their guns, swords, and fierceness. It’s just so natural for them to be unique to their gender. Elyse is also so so much more dramatic then the boys. Last night she was so tired from a “no nap” day, and the wheels were all coming off. She lay on her pillow and sadly told me “mom, I’m just not having a good life!” I told her that that’s the way I can feel too when I’m over tired, and things will look different in the morning. =) (thank God!) On the way home from taking Ravi to school this morning she was wistful for candy. Then she said “mom, just think of the world”. After asking her more about what she meant, she let me know that the whole world can have candy, but she can’t. lol. Yes, my girl seems to feel much more deeply and is so much more in touch w/ her emotions…. sometimes causing her mom a bit of stress too! -The doctor’s office going on in our livingroom for the last two days. The kind concern for the sick is amazingly sweet. -Hearing school hockey game details from the 3 oldest. i wanted you to come too! wahhh. i love mornings! not the actual getting up part. 😉 the have my coffee mug in my hand don’t need to go anywhere part~when that happens. we eat all together, The Farmer usually cooks, the house is cozy, and then jake and i can color and snug and i don’t want this time to end. your girls always look and sound so FuN. great picture, sweet post.